UPMC’s Information Services Division Rotational (ISDR) program is a two-year leadership development program that provides participants with four six-month rotations exploring areas of information services and technology. What gets you up in the morning and gets you moving? What makes you excited to go to work every day? For many of us, the answer to that question is how fulfilled our jobs make us feel. We asked our Information Services Division Rotation (ISDR) program participants how being ISDRs has kept them motivated as health care IT professionals. 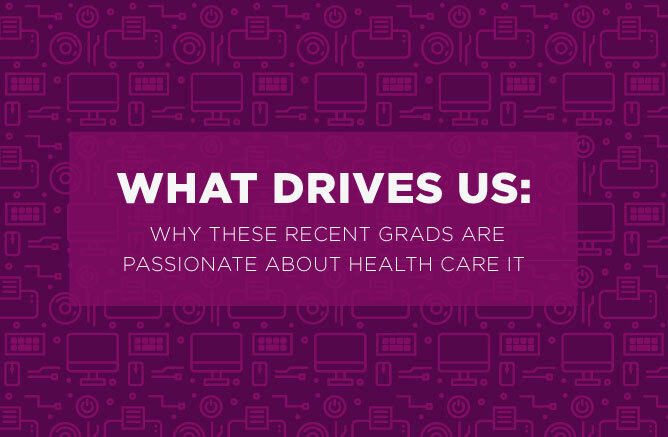 Their responses shouldn’t surprise you; they enjoyed the meaningful challenges they’ve overcome, the opportunities they’ve had to make a difference, and the new skills they’ve learned during their stints as ISDRs at UPMC. See what they had to say! There is never a dull moment for ISDRs, and it sounds like they love it! Many of the ISDRs mentioned that they enjoyed feeling accomplished; they loved the challenges they are given and the opportunities they have to make real contributions. “The most challenging parts of my work have been what motivate me and make me want to go to work.” – Kendall Cutrona. Participants in the ISDR program make real, meaningful contributions to their teams. And the work ISDRs do affects more than just the teams they work in. It has an impact on everything UPMC does. “I’m motivated by knowing I am doing valuable work that not only helps UPMC, but also patients, doctors and researchers,” – Rebecca Kahlbaugh. Learning New Skills While Doing Work They Love! ISDRs rotate four times during the two-year program, and there are a lot of opportunities to learn and grow as IT professionals. “Solving problems, learning new skills, and ultimately helping others motivates me in my career every day.” – Nicholas Bakertges. We all want careers that motivate us. If meaningful challenges, making a difference, and learning new skills motivate you, too, we think you’d be a pretty great addition to the UPMC ISDR program! Why don’t you check it out and see if it’s right for you? Interested in becoming an ISDR at UPMC? With a full-time salary and full-time benefits, you will gain high-level exposure to all of our executives and gain valuable industry experience while you’re at it! Upon completion of the program, graduates are highly sought after for complex roles across the organization. Learn more about UPMC’s ISDR program.